of UToledo Master of Science in Accountancy alumni* find job placements, with an average starting annual salary of $55,000. Achieve greater breadth and depth of knowledge — and increase your earning potential — with The University of Toledo's Master of Science in Accountancy (MSA), a one-year master degree in accounting. As an AACSB-accredited accounting graduate school, the UToledo College of Business and Innovation's Department of Accounting will help you learn advanced skills for high-level, long-term success as an accountant and business leader. UToledo's accounting master's degree program is also specifically designed to fulfill Uniform CPA Exam requirements, so you can qualify to sit for the test in Ohio and other states. Fast, flexible track to success. 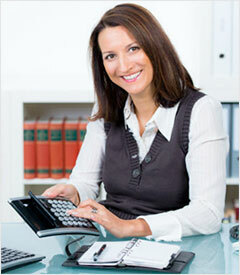 Earn your master’s degree in accounting with only 10 courses — or 30 credit hours. Choose from a mix of online and evening classes that fit within your needs and schedule to complete the MSA in nine months of full-time study or enroll part time. National reputation. Get your master’s degree from one of the best masters of accountancy schools in Ohio and the nation. UToledo's Accounting Department is a member of the Federation of Schools of Accountancy (FSA), which is "committed to the promotion and support of high-quality accredited graduate accounting programs". Small classes, experienced faculty. Enjoy individual attention from dedicated accounting faculty. The average class size for UToledo students earning a master’s degree in accountancy is 20, which supports interaction and collaboration with other graduate degree candidates, unique perspectives from professors experienced in the field, and real-time responses on hot topics in the industry. CPA exam prep. Increase your odds of passing the CPA Exam, with help from the Alan Barry Workshop Series and the free Alan Barry Accounting Lab. It's the only facility of its kind in the nation with lab licenses for CPA and CMA review material. Nationwide, MSA graduates have higher pass rates than those without the graduate degree. Advanced job skills. Achieve higher-level career success in a dynamic work environment. The master’s degree in accountancy program gives you professional experience with critical and analytical thinking, leadership, teamwork, effective communication, and big data and data analytics — vital skills for competing in today's job market. With a 100% job placement rate* within a year after graduation, University of Toledo graduates have the potential to increase their starting salary by more than 20% with an accounting master's degree. University of Toledo alumni are highly sought after by top local and national accounting firms, corporate entities and Fortune 500 companies in Toledo, Ohio, and the U.S.
With a variety of online and evening courses to choose from, you can earn a master's degree in accounting on your own time and schedule to achieve your career goals. MSA students can also combine coursework from available options to earn additional degrees — such as a juris doctor (JD) or master's in business administration (MBA) — in related areas of study for diverse options along a career path.